The Mile End brisket: Deliciously Canadian. LEAF-PEEPING: It’s Canada Day, and there are plenty of opportunities to attend Molson-soaked bashes at bars around town. Our recommendation: Skip them all, leave work early, and hit Mile End for a feast of Montreal-style house-smoked meat. 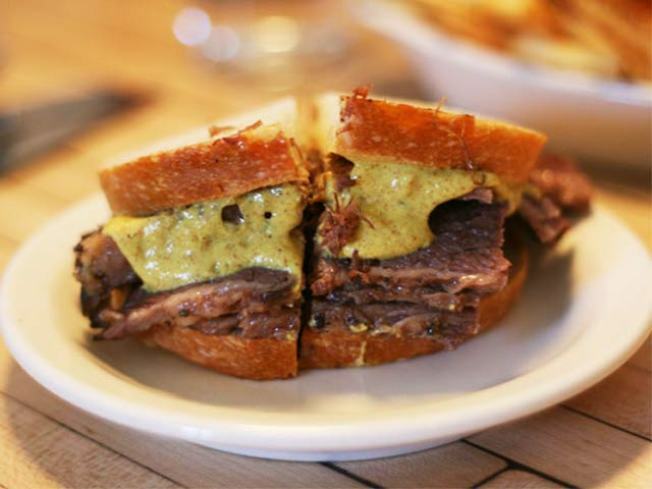 The fact that the folks behind this awesome Canadian deli in Boerum Hill have preposterous, just-because-we-can rules (don’t want mustard on your sandwich? that’ll be ten cents extra) is all the more reason. Until 10PM (but the meat disappears early). EXTRA SPIRIT: Didn’t have a ticket to last night’s sold out Delta Spirit show at Bowery Ballroom? Here’s your second chance: The band decamps the island and parks their blend of rocky Americanaat the Music Hall of Williamsburg tonight.8PM. POMP, CIRCUMSTANCE: Or, in the spirit of NAFTA, you could celebrate Canada Day with a 14-piece brass band playing Mexican banda—a contemporization of brass band music with the modern sounds of ranchera and more. All 14 members of the Banda Sinaloense De Los Muertos pack into the tiny back room at Barbès, playing “classic tunes to get dead drunk to”—which is actually fairly Canadian after all. 8PM.